Amazon boss Jeff Bezos has revealed further details of the big, reusable rocket he has been developing inside his Blue Origin space company. The New Glenn, as it will be called, is designed to launch satellites and people from Cape Canaveral in Florida, the entrepreneur says. The vehicle will come in two configurations, with the biggest standing more than 95m (313ft) tall. 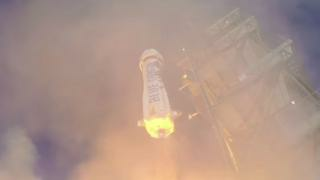 Mr Bezos aims for a first launch before the end of the decade. Blue Origin has shown impressive progress recently on its much smaller, sub orbital-rocket and capsule system known as New Shepard. This has flown five times over the Texas desert, with the booster returning to Earth safely on the last four occasions. But Mr Bezos has always spoken of his desire to build a much more capable vehicle – and the New Glenn is it. Named after the first American to orbit the planet – John Glenn – the 7m-wide (23ft) rocket will be powered at its base by seven engines burning liquid methane and liquid oxygen. This is envisaged to produce a thrust of 17.1 megaNewtons (3.85 million pounds force) at lift-off. By way of comparison, Europe’s Ariane 5 rocket produces 13 megaNewtons from its main liquid-fuelled core-stage engine and two sold-fuelled solid motors. As with the New Shepard booster, the New Glenn’s main stage would come back to Earth to make a controlled landing after its mission. 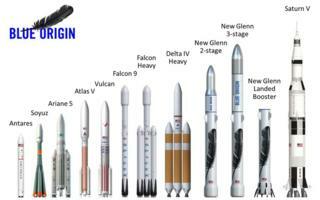 The New Glenn’s first stage would be topped with a second stage, and, if needed, by a third stage. Both of these additional segments would be powered by a single engine burning liquid hydrogen and liquid oxygen – the same engine as powers the New Shepard now. The full configuration would be required to send payloads beyond low-Earth orbit. A year ago Mr Bezos announced that he was leasing the historic Launch Complex 36 at Cape Canaveral, which was used by the rockets that despatched some of the first inter-planetary probes. Manufacturing facilities were also to be set up in the area. The entrepreneur is gradually ramping up his space activities. The same methane engine, the BE-4, to be used on the New Glenn is currently in competition to power another rocket operated by the Boeing and Lockheed Martin joint venture – United Launch Alliance. This rocket, to be called the Vulcan, would be the successor to the vehicles that are presently used by Nasa and the US Air Force to launch most of America’s science and national security missions. Blue Origin continues work on its New Shepard system, which is expected to be used in due course for tourist flights and for micro-gravity experiments. The next launch is scheduled in a few weeks, when an emergency abort will be practised. This procedure will see the capsule separated from its booster early in the flight to simulate a problem. It is the type of test engineers carry out to prove a spacecraft is safe to carry people.